Did You Know That Allegany State Park Played A Role In Wild Turkey Restoration? The wild turkey is native to North America, but suffered severe declines due to wide-scale forest clearing and over hunting. By the mid-1800’s, this great bird was gone from New York state and much of the northeast. However, in the mid to late 1940’s, some wild turkeys were observed along the NY and PA border from Allegany State Park to the Genesee River Valley, a sign that the habitat might be recovering and able to support them again. So, in the early 1950’s, the New York State Conservation Department (forerunner to the NYS Dept. of Conservation) began a restoration effort in the early 1950s. They started with game farm turkeys, but after a few years, this effort failed because the game farm birds were not wild enough to avoid predation and lacked the capacity to survive. Flock of hens in the forest in the 1950’s. Meanwhile, a healthy breeding population of wild turkeys expanded from Pennsylvania into the Allegany State Park region of New York. Park managers then gave the Conservation Department permission to trap turkeys in the park, initiating the wild turkey trap and transfer program which began in 1958 and concluded successfully in 1974. This program allowed for more rapid expansion of the turkey population to suitable unoccupied habitats. Tom turkey displays his tail. The turkeys trapped in Allegany State Park were moved to several areas in the Region and then throughout the state. In addition to the in-state trap and transfer, turkeys from the park were also sent to Connecticut, New Hampshire, New Jersey and Vermont. Other trapping efforts in the region and elsewhere in New York sent birds to Delaware, Minnesota, Rhode Island and the Canadian Province of Ontario. New York turkeys helped re-establish populations throughout the Northeast, Midwest and southeastern Canada. Nets ready to trap a flock of turkeys. Turkeys caught in a net. New York State Conservation Department was one of the pioneers among state agencies to restore wild turkey populations in the United States. This program would not have been successful without the cooperation of Allegany State Park and to this day is recognized as one of the greatest wildlife management success stories of North America. Wild Turkey Restoration exhibit in the Red House Natural History Museum, image from DEC Conservationist, October 2017, p 28. In 1782 Benjamin Franklin wrote “the wild turkey is a bird of courage that would not hesitate to attack a grenadier of the British guards, who should presume to invade his farmyard with a red coat on,” in an effort to promote the turkey over the bald eagle as the national emblem of the United States. Although the turkey was not selected to hold the prestigious position of national emblem, the bird is certainly an icon for the month of November and the celebration of the Thanksgiving holiday. 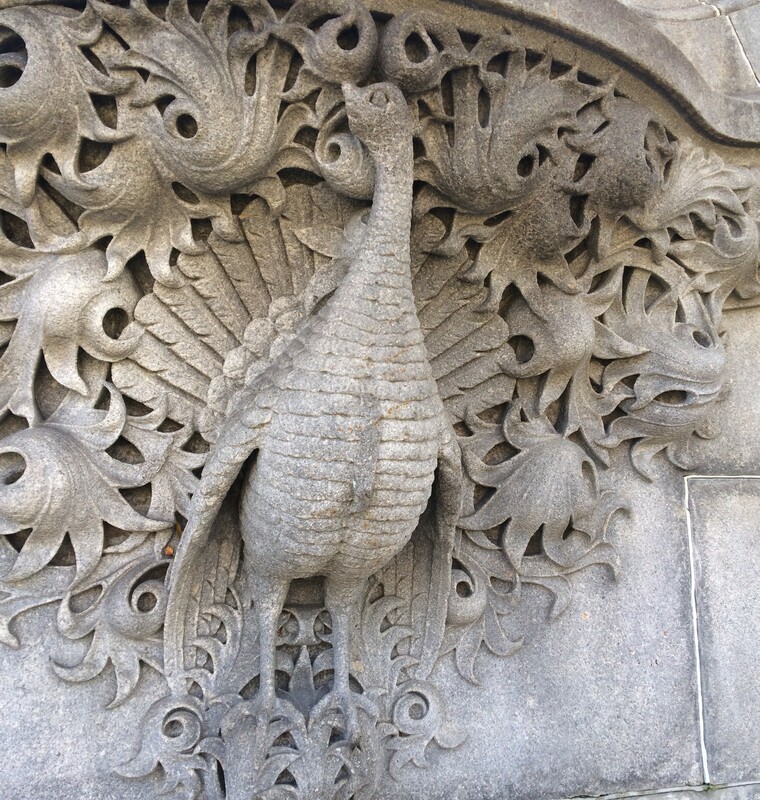 A turkey is featured on the New York State Capital building. Photo by Lilly Schelling, OPRHP. There is much more to know about turkeys than what side dishes the bird pairs nicely with on the Thanksgiving table. To be the hostess with the mostess (turkey knowledge, that is) try sharing some of the following fun facts with your dinner guests this Thursday! Turkeys can run at speeds of up to 25 miles per hour and can fly up to an impressive speed of 55 miles per hour. The area of bare skin on a turkey’s throat and head changes color depending on its level of stress or excitement. A male turkey’s head will turn blue when excited, or turn red when it is preparing to fight. 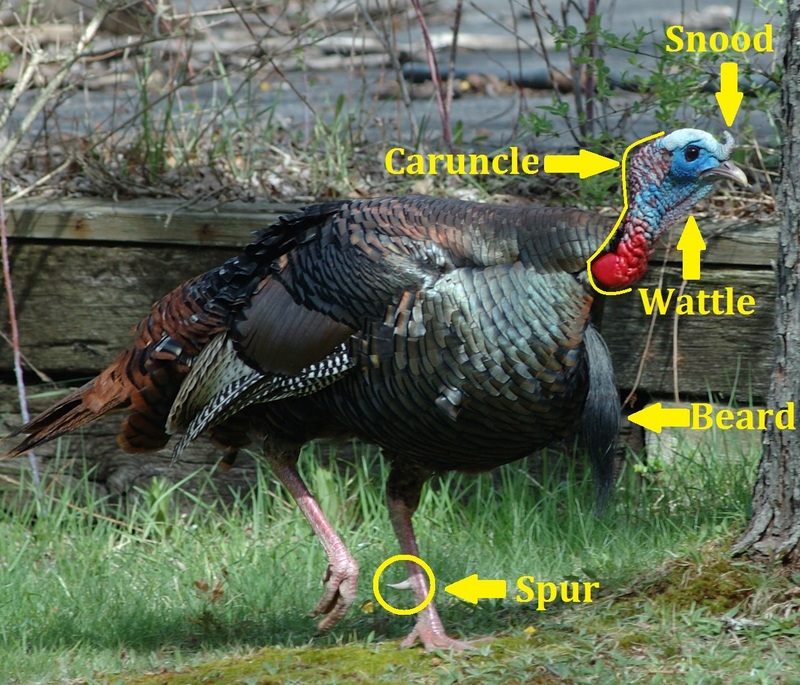 Male turkeys have beards and spurs. The older the turkey, the longer the beard. Females are called hens, chicks are known as poults, and young males are jakes. See the photo below for more information about turkey anatomy! Because turkeys have a number of natural predators, including foxes, coyotes, and raccoons, they often sleep perched atop tree branches with their flock. In the morning, they call out a series of yelps before descending from the tree to ensure that the rest of their roosting group has made it safely through the night. Turkeys have excellent daytime eyesight that is 3x better than a human’s! A turkey’s vision range covers 270 degrees, and they can also see in color. Turkeys have poor vision at night. Wild turkeys were almost hunted to extinction by the early 1900’s, but recovery efforts have brought their numbers up to seven million across North America today. Allegany State Park in western New York was the source site for turkeys that were later reintroduced across the rest of the state in the 1950’s. It was presumed that these turkeys wandered across the state border from Pennsylvania. Above: A male turkey (called a tom) at Minnewaska State Park Preserve. Photo by OPRHP, edited by Lilly Schelling. Post by Megan Phillips, OPRHP. Photos by Lilly Schelling, OPRHP.